The brand new Persistence Pro© range of solid tungsten carbide tooling features a high performance DLC (diamond like carbon) coating on precision-ground K10 grade bodies. The coating of SP2 graphite and SP3 diamond gives a harder surface coat with a lower friction co-efficient, which means a tool life of typically 2-3 times that of untreated solid tungsten carbide. 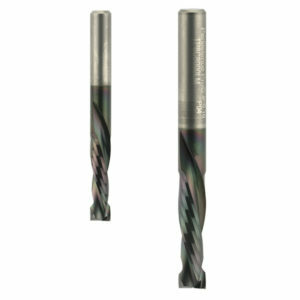 The 2+2 flute compression spirals have two short up cut an two long down shear cut flutes. 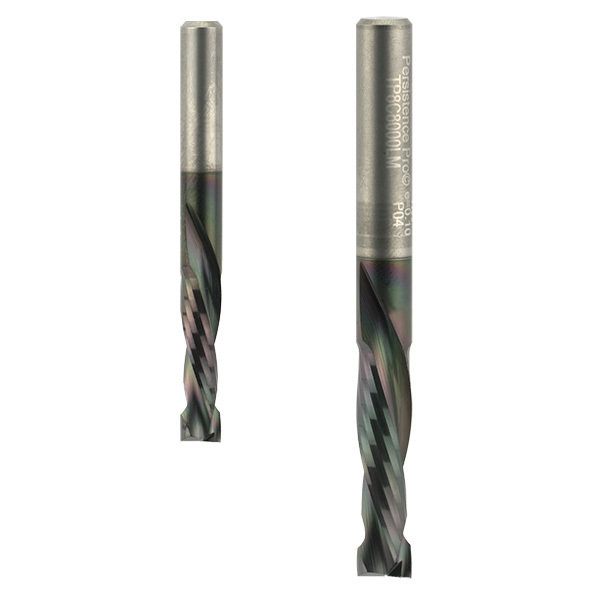 This provides down shear cutting on the top and a short up shear cut on the bottom of the tool for multi-pass cutting without damaging the top surface. Ideal for edge trimming or nesting on double faced veneered boards, these cutters ensure a good finish on both faces of laminated boards, solid timber boards and MFC. Available to buy online at the Wealden website.